One thing that I knew for sure, when picking books about Venezuela: I needed to choose a wide assortment of books, representing a wide assortment of voices. All the Venezuelans I have met are securely in the opposition camp. When I have mentioned the name “Chávez,” I received either a slim smile and a slight shrug meaning “Let’s not talk about this right now,” or a long speech about justice and rights. I knew that if I wanted to hear/read voices in favor of Chávez and the Bolivarian Revolution, I would need to find them myself. 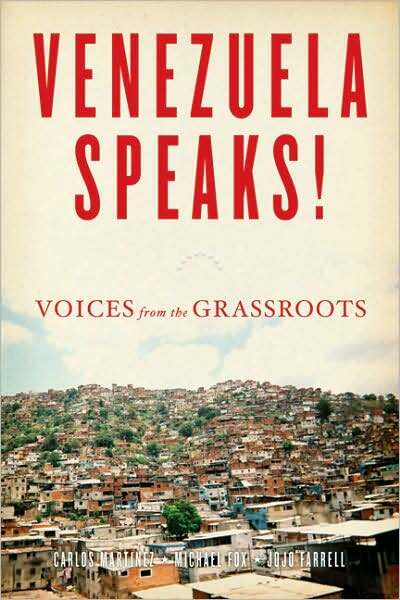 I ended up choosing the book “Venezuela Speaks! 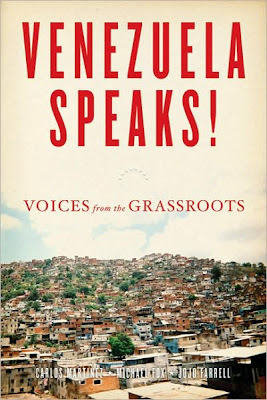 Voices from the Grassroots,” by Carlos Martinez, Michael Fox, and Jojo Farrell, which is written in the form of short interviews by people associated with the Bolivarian Revolution. The authors argue that the Bolivarian Revolution is not dependent upon Chávez , but that the rise of Chávez to power is just a sign of a larger political movement: of the “bottom-up” political process, where the masses – who have often been voiceless and powerless in the past- take on active roles in democracy. The authors support this claim by including interviews which not only criticize the system before Chávez , but show discontentment with the Chávez government as well. The authors’ argument is especially interesting as we consider the current political atmosphere of Venezuela, which is experiencing a void without Chávez ’s presence. To be honest, I found this book somewhat difficult to read – not because I was opposed to what was being said, but rather I felt like I was reading the same voice over and over again: This was the situation before and these are the injustices that we faced. Now things have changed. This is what I do now in the Bolivarian Revolution. Things still are not perfect and this is what needs to change. Most of the people in the book seemed to lack original ideas: While they all had different experiences, they had all taken up the same ideas about how to advance the future – something which made the book seem less legitimate, in my view. Granted, there were a few people who presented ideas in unusual ways. One was Marianela Tovar, a LGBT activist in Venezuela. She does not credit Hugo Chávez with explicitly helping the movement. However, she does credit him for changing the political atmosphere, so that the LGBT movement could begin organizing itself: “There was a political spark [with Chávez .] Before there was apathy and indifference toward politics; there was a very pessimistic attitude toward the future of the country…” (page 97.) She draws her own experience, noting that although she knew that she was a lesbian in the early 1990s, she saw no reason to take on a role of activism during these years.